What if a D&D friend of yours moves out of town, or has some other reason preventing him/her from joining the fun? Many times in my life, I have had players leave the realm of pen & paper RPGs for one reason or another. At some point, most of us will need to find new blood to fill the void of a lost player. Unfortunately though, recruiting new players can be a very difficult task for several reasons. It is, admittedly, a hard game to grasp at first. New players can be overwhelmed by the nearly endless choices. There is also the stigma that if you play D&D you’ll end up LARPing in the local park every Saturday afternoon. So, with all of these potential setbacks, how do we get new people excited about this great game? I have a simple solution: the more gently you ease players into their first session, the more likely they are to come back. Most people will try a new board game or party game without hesitation, but have never even considered playing D&D. The first thing you should do is help new or potential players to understand anything they might be unsure about. When you explain to them, use examples and similarities to things they already like. Tell them it’s like acting, improv, board games, charades, books (fantasy or otherwise) or video games that they enjoy. 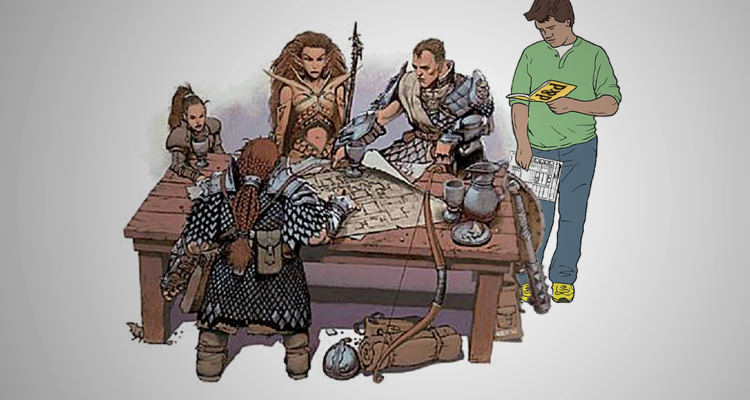 Once they see how D&D is in line with things they are interested in, they will be more willing to give it a chance. 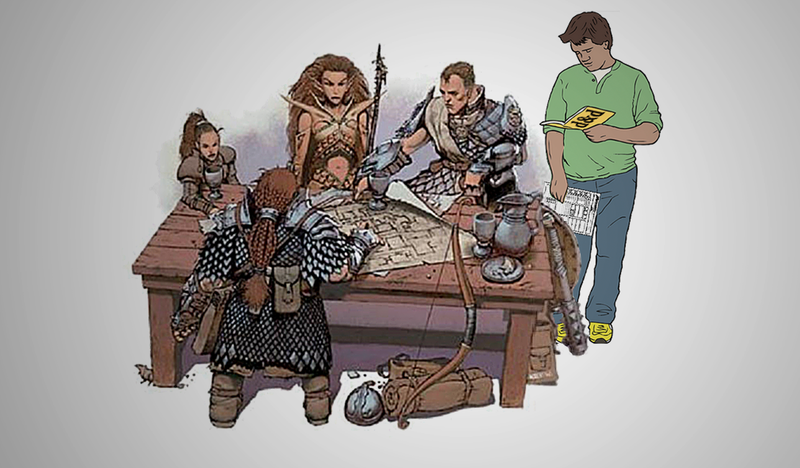 Most people will try a new board game or party game without hesitation, but have never even considered playing D&D. This always amazes me because, the way I see it, D&D is the natural evolution of both of these game types. Both require creativity, energy, enthusiasm, and time. So, why not make D&D as accessible as possible? Pre-made characters make it easy for any new player to get the hang of the game without being bogged down in character creation. All of the numbers and abbreviations can take hours to fully understand, and certain classes require decisions at first level that can make the whole game seem intimidating. While most seasoned players will love creating their characters, first-time players might be overwhelmed by the possibilities. That said, a player should still feel free to adjust the pre-made character to their needs and tastes. If you have a player who is showing confidence and eagerness to exercise their own creativity, encourage them to change things up! The key is to hook new players in, and to keep them coming back for more. One-hour sessions will make it easy for anyone to feel comfortable with the commitment. Devoting three or more hours to any game can be very difficult to work into a schedule. If you set up a group with the promise of playing for only an hour, you’ll find most people willing. In this case, you should use a quick two-minute setup, and move right into an action packed adventure, followed by a skill-focused followup to keep everyone wanting more. If your players want to keep playing after an hour has passed, your mission is accomplished! You’ve succeeded in getting new people to like D&D! The more you use simple rules the first time around, the more confident your players will be when they start learning the complex ones. One way to ensure eagerness for more game time is to have the players arrive in a town after their first adventure. They might find the town to be raided and ruined, or they might hear that someone has been kidnapped. Now they will want to ask questions and figure out their next goal. Your job is to keep the excitement up, so maybe you’ll want drop them into a battle scene as soon as possible. Be sure to focus on the rules that matter most. I recommend keeping it to the basics (e.g. combat rules, skills and class abilities) as much as possible. The more you use simple rules the first time around, the more confident your players will be when they start learning the complex ones. If one of your players wants to tackle an adversary outside of combat rules, let them do it for free the first time, but be prepared to explain it in full afterwards, or during the next session. This method should promote fun, creativity and understanding, instead of focusing on what is or isn’t allowed, in the long run. If you follow these three steps you’ll find your friends more eager to engage in, and share your love for role-playing! What are your successful tactics for recruiting new players to D&D? I like to poison them and tell them I’ll only give them the antidote if they join my RP group. Another thing I have found to be helpful when introducing new players is actually helping them as you go and explaining the rules when it comes up.